My children are 8, 6 and 5 and one of our favorite bonding activities is to have daily stories read aloud together. We recently selected Escape From Mr. Lemoncello’s Library which is a wonderful read-aloud story or a chapter book for older readers. This fabulous children’s story features young Kyle who feels discouraged as he competes with his two older brothers who he feels are better at sports and smarter than him. One area that Kyle excels in and loves to do is play board games and all other games so when Kyle discovers that the town library is having an invitation only lock-in gaming competition hosted by the world’s most famous game maker he decides to enter for a chance. Luigi Lemoncello, notorious game maker is Kyle’s hero so the young boy can’t wait to take on this challenge. Kyle soon learns that getting in to the library for the game is the easy part……….getting out may be the trickier than he ever imagined. My children love puzzle mysteries so this was the perfect book to enjoy reading together. Therefore, we were hooked on this suspenseful and fun story as we tried to figure out how Kyle and the eleven other players would end up getting out of the library. There are a series of clues and secret puzzles at every turn that must be solved in order to find the hidden escape route. It reminds me of a unique twist on the Willy Wonka story promoting an imaginative plot, interesting characters and delightful twists and turns. Recommended for ages 8 and up, this is definitely the correct target audience as my eight year old son asked if he could keep the book to re-read it by himself after we were finished with it as a read aloud….he loved it! 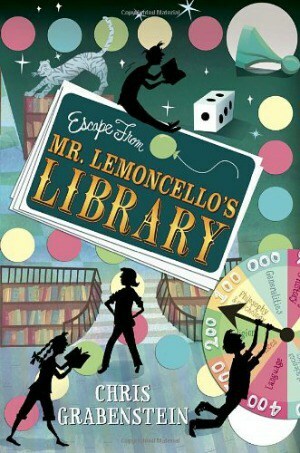 Escape From Mr. Lemoncello’s Library is available for purchase at many book retailers and online at Amazon. I learned that the author has one dog and three cats.